RP31556 is rated 5.0 out of 5 by 5. Rated 5 out of 5 by Pattily from perfect replacement I updated the hardware in my tub from silver to oil rubbed bronze. I was happy to find the perfect replacement parts. It looks great and installed in a minute. Rated 5 out of 5 by sem0 from I was looking for a drain stop that wasn't fixed on so that I could use a catch screen in the drain. This one screws in easily and holds the water well when I need to use the tub. I just unscrew and store when not needed. Rated 5 out of 5 by John from An Exact Match This is the perfect item to finish my bathroom remodel. The finish perfectly matches the Delta Venetian Bronze of the faucet and spout (Delta Model 1400 series). I tried another "Venetian bronze" tub waste/stopper and the finish didn't quite match. Delta Faucet model # RP31556 has a diameter of 3.39 inches Is this spec inside or outside diameter? I need the largest plate I can get and I think this is it. Problem is I can not find the associated gaskets/washers for this overflow plate. there must be an over-sized rubber gasket/washer that is made for this plate specifically. I have an older tub that the overflow plate has gone bad. It takes a 3.5 inch inside diameter plate with two screw holes 2 inch center. All I can find are 3 inch plates. They are too small. Is anything like that available? Thank you for your question. Delta Faucet model # RP31556 has a diameter of 3.39 inches and the holes are 1.94 inches apart. This is the only size we have available. You might check with the tub manufacturer to see if they can recommend anything if this size will not fit. What is the depth of the plate? Distance from front face of plate to back edge that touches the tub. My tub overflow install requires ~1/2&quot; depth. Thank you for your question. Delta Faucet model # RP31556 is 3/8&quot; thick. What are the sizes of the screws (thread size and length) used with this overflow plate? Is this compatible with RP293? Do you make this or a similar overflow plate in matte black? 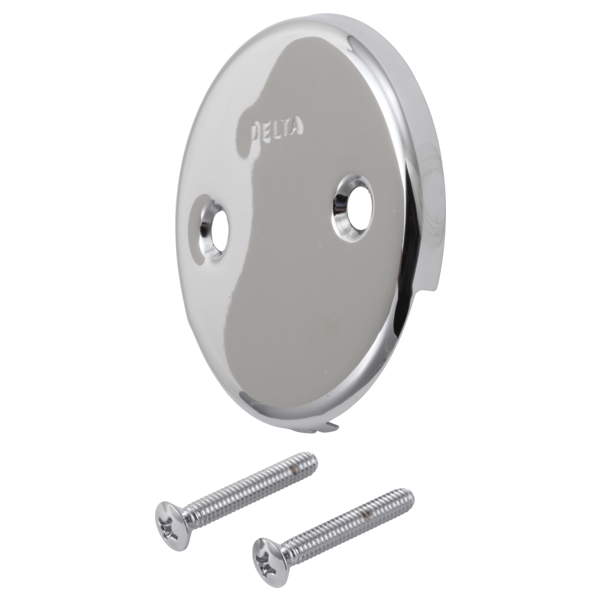 The Delta overflow plate has two holes. My tub has only one hole. Is there an adapter bar that will convert the one hole (tub)to two hole (overflow plate)?